On a glorious summer's morning I set off early from Hengelo and crossed the border into Germany. I had already booked my rail tickets for this trip online, taking advantage of their excellent 'Sparpreis' deal which allowed me to buy the tickets for less than half of what I would have paid on the day. Changing in Osnabrück, I arrived in the beautiful north-western port city of Bremen with plenty of time for Bratwurst, potato salad and beer. Even three hours before kick-off, the city centre was absolutely teeming with Werder fans, most of whom were happily tipsy and more than a little noisy on the bottles of beer they carried with them. The Leverkusen fans who were beginning to arrive by train in the city were also joining in the party atmosphere outside the impressive Hauptbahnhof and in and around the market square. The Weser-Stadion, situated down on the banks of the river Weser, is some distance from the centre of Bremen and although walkable (perhaps 45 minutes), the city is served by an excellent tram system. Line 10 from platform C outside the station takes you within a five minute walk to the stadium which is a truly awesome sight as you approach it from the road above and begin to realise it's imposing scale. Inside, it's a spectacular bowl of a venue with a continuous sweeping roof and two levels of seating, reminding me of the old Wembley a little. Today the Weser-Stadion was a near capacity sea of green and orange. When the club's World Cup trio were reintroduced back to the fans and thanked for their efforts for their country over the summer, the noise was deafening. Torsten Frings, Tim Borowski and Miroslav Klose would all play a big part in Werder's second victory of the season today. 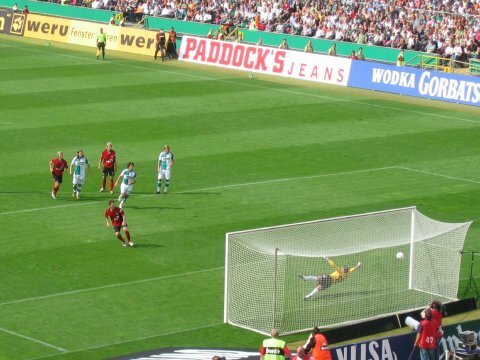 Having finished as runners-up in the Bundesliga last season, the programme and the national press were of the opinion that Werder would seriously challenge a Ballack-less Bayern this season and although their form today was a bit hit and miss, the immense talents of Frings, Diego, Almeida and Klose – who scored with the type of deft header that only he could – was too much for a Leverkusen side who dominated long periods of the game. After the match on a packed tram I noticed the amount of Werder bags and merchandise that had been purchased by the fans and reflected that this must be one of the most exciting clubs in Europe to support right now. An excellent day all round with good football in a fine stadium in a beautiful city.